I finished the second book in this duology, Crooked Kingdom, literally about five minutes ago and I have to talk about this series immediately. I feel sad, nauseous and a little bit giddy, all at the same time. This series, especially the second book, is the best I’ve read in a long, long time. Plot summary: Criminal prodigy Kaz Brekker has been offered wealth beyond his wildest dreams. But to claim it, he’ll have to pull off a seemingly impossible heist:Break into the notorious Ice Court (a military stronghold that has never been breached). Retrieve a hostage (who could unleash magical havoc on the world). Survive long enough to collect his reward (and spend it). I was dubious about starting this series as I did not like the Grisha books. The Shadow and Bone series wasn’t bad exactly, but there was nothing particularly unique about it and it wasn’t written overly well. I’m not sure if I finished the first book, but I definitely didn’t carry on to the second. This series, written by the same author and featuring the same world, did therefore not exactly recommend itself to me. Then Charlotte, whose opinion tends to echo mine in a lot of bookish things, read Six of Crows (review here), and she ended up buying it for me as a Christmas gift. Turns out that I’m really, really glad I didn’t avoid these books just because I didn’t like Leigh Bardugo’s original serie, or I’d have missed one of my favourite books of the year so far. Admittedly it’s only April, but I’m confident it’ll stay a firm favourite. I’m a sucker for books about close knit groups of wildly different people, all working towards a shared objective, bonding and bickering along the way. It’s why I loved A Long Way to a Small, Angry Planet so much, and other books like Theft of Swords. Six Crows and Crooked Kingdom do that perfectly. The way the relationships develop and change is so perfect and so subtle – I’m not sure I’ve ever seen characterisation performed so beautifully. The characters are so different, but the way their personalities interweave is wonderfully crafted. My favourites were Kaz, the criminal mastermind with his own special brand of neuroses, Inej, the gentle but talented wraith and Wylan, the quiet demolitions expert scorned by his Father. However, and unusually for a book with changing perspectives, I was interested in every single one of the six characters. All of them. They were so wonderful and their perspectives so unique, that for once I didn’t mind from whose viewpoint I was reading. It alternates every other chapter and, considering that means six perspectives, it’s a difficult feat to stop the reader from getting frustrated. Normally I hate romance in books like these – it’s usually unnecessary and shoehorned in for the sake of it. Here though, it’s more of a subplot of a subplot. It’s so subtle and non-attention-grabbing that I actually felt the story was better for it, which is something I never actually thought I’d say. The end result of the relationships was never straightforward and yet it was always suited the couple involved to the nth degree. So, so perfect. The story itself is wonderful too. 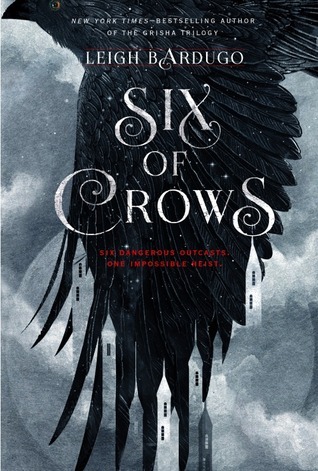 Six of Crows is a simple heist (well, not so simple at all, but the premise is straightforward at least – ‘steal some stuff’) and Kingdom of Crows is a more complex plot where the characters have to deal with the less than ideal consequences of the aforementioned heist. Each book has so many twists and so many turns that I lost count of the time I wanted to gasp at how Kaz Brekker tricked me (and everybody else) again. The writing style is completely different to the original Grisha trilogy, to the point where I wouldn’t have believed it was written by the same author. It’s adult, it’s complex and parts of it are simply beautiful. I don’t know what happened between that series and this one, but it worked. Charlotte told me that Crooked Kingdom was even better than Six of Crows, but I didn’t really get on board with that until close to the end. Because I read them so close together, they sort of merged into one book for me. Well, until the end of Crooked Kingdom. I CRIED. I actually sat there and properly cried. It’s an actually perfect ending that suited all the characters. I loved that it wasn’t perfect, that not everybody got a happy ending and that it wasn’t what I had hoped would happen – it was better than that. It was brave and awful and amazing and… ARGH. It’s perfect, for all the characters. A third book hasn’t been announced and, strictly speaking, the story has been concluded. However, there is scope for another book (or another hundred, fingers crossed) and I cannot wait for that day. I swear, the second that book is announced, I’m on it. For a series I didn’t even want to read, it’s amazing. Hell, for a series I did want to read, it’s still amazing. The prose is beautiful, the characterisation is masterful and I absolutely didn’t want to put this series down for a second. And look – I found a shop on Etsy that sells Six of Crows themed candles! 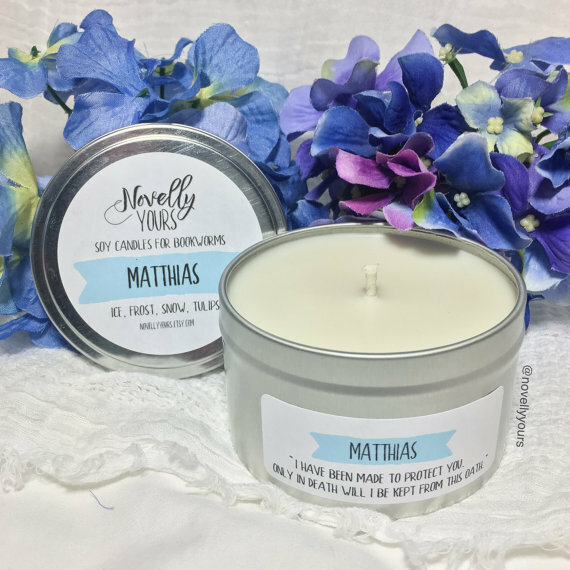 You can buy a Matthias candle or a Wraith candle, and Novelly Yours have kindly offered to give all you lucky readers 10% off! Just use the code TAKEOFF10. What was your favourite book of 2017? I loved it too. I can’t wait for the next book, if there is one.